* The share price is the closing price on April 28. The number of shares issued was obtained by subtracting the number of treasury shares from the number of outstanding shares as of the end of the latest quarter. * The forecasted values were provided by the company. From the term ended Apr. 2016, net income is profit attributable to owners of the parent. Hereinafter the same applies. This Bridge Report outlines the results of ITO EN for the term ended Apr. 2017, and includes the outlook for the term ending Apr. 2018 and the interview with the president Honjo. ITO EN mainly manufactures and sells beverages (including green tea, coffee, and vegetable juice), and tea leaves, and also operates restaurants and conducts franchise (FC) business of Tully's Coffee, etc., manufactures and sells supplements via its subsidiaries. In the Japanese market of green tea beverages, including "Oi Ocha," the company has the largest share (33% as of Dec. 2016). With the aim of becoming a "Global Tea Company," it is developing the brand and cultivating new green tea markets in the U.S. (mainly New York), Australia, China, and Southeast Asia. Management Principle "Always Putting the Customer First"
The business of ITO EN is classified into the Tea Leaves and Beverages Business, which manufactures and sells tea leaves and beverages, the Restaurant Business, in which Tully's Coffee Japan Co., Ltd. operates specialty coffee shops and FC business, and other businesses, in which Mason Distributors, Inc. (Florida, the U.S.) manufactures and sells supplements. For the term ended Apr. 2017, the non-consolidated sales of ITO EN accounted for 84.5% of the Tea Leaves and Beverages Business (78.1% of consolidated sales). As for the composition of non-consolidated sales, tea leaves make up 9.1%, beverages 90.0%, and others 0.9%. ITO EN sells various leaves tea products nationally, especially green tea, barley tea and oolong tea, and promotes its business in the green-tea leaf convenience market with products such as teabags and instant teas. With such events as the "Big Tea Party Events" (= treating guests to teas brewed by the employees who are "Tea Tasters") throughout the country and opening directly-managed specialty stores at the airports which attract overseas tourists visiting Japan, it is also working on boosting demands. In the beverage sector, it owns such brands as the No.1 tea-type beverage mega-brand "Oi Ocha" with its taste and quality achieved through flavoring agent-less and 100% domestically-grown leaves; the No.1 non-caffeinated tea-type drink "Kenko Mineral Mugicha (Healthy mineral barley tea)" with its roasting technology to bring out the aromas and flavors; "TULLY'S COFFEE" that leads the bottle-shaped canned coffee market in collaboration with Tully's Coffee Japan Co., Ltd.; and "Ichinichibun-no-Yasai (One Day Veggie)," the No.1 100% vegetable juice. Additionally, the dairy products such as milk and yoghurt are produced and sold by Chichiyasu Company, based in the western part of Japan (the joint development products are stocked and sold by ITO EN). With its long-term vision of a "Global Tea Company", it is working on establishing its brand and cultivating the new green tea markets in the U.S., China, South East Asia and Australia, and aiming to achieve an overseas sales ratio of 10% in the near future (7% in the term ended April 2017). In the U.S., the following three companies are in operation: ITO EN (North America) INC. (NY), which promotes green tea and the brand to the natural foods market nationwide and the national chains; Distant Lands Trading Company (around Seattle, WA) for the production and sales of coffee beans; and ITO EN (Hawaii) LLC., which produces and sells beverages in Hawaii (Mason Distributors, Inc., which produces and sells supplements, is categorized into "Others"). In China, ITO EN Beverage (Shanghai), Ltd. is marketing the beverages and tea leaves for the Chinese market, while Fujian New Oolong Drink Co., Ltd. (Fujian Province) is responsible for the production, export and sales of beverage products, etc. Additionally, Ningbo Shunyi Tea Products Co., Ltd. (Zhejiang Province) is in charge of the production and export of oolong tea. In South East Asia, the following companies operate business under ITO EN Asia Pacific Holdings Pte. Ltd. (Singapore): ITO EN Singapore Pte. Ltd. (Singapore) for the sale of beverages and tea leaves in Singaporean and Malaysian markets; ITO EN (Thailand) Co., Ltd. for the sale of beverages and tea leaves in the Thai market; PT ITO EN ULTRAJAYA WHOLESALE for the sale of beverages in the Indonesian market; and PT ULTRAJAYA ITO EN MANUFACTURING for the production of beverages in the same market. On top of these, ITO EN AUSTRALIA PTY. LIMITED (Australia) operates tea plantations and crude tea production factories. This business is mainly operated by Tully's Coffee Japan Co., Ltd., which was made into a subsidiary in October 2006. Through the joint purchase of raw materials, the active opening of new stores and the revitalization of the existing stores, its sales increased and profitability also improved rapidly. "Tully's Coffee" was established in 1992 in Seattle, USA, and it opened its first Japanese branch in Ginza in 1997. It aims to meet the only the highest quality: it uses the beans carefully selected from all over the world, roast them in Japan, and all espressos are brewed cup by cup after each order is placed using hand-operated machines. It offers an enriched food menu that goes well with the coffees. TThe company's business strengths lie in the following characteristics seen in Production & Distribution, Operation & Sales, and Safety & Hygiene Management. Also, it continues its unique effort to secure a stable procurement of tea leaves. The company operates the production/distribution block system, dividing target regions into 5 blocks (Hokkaido/Tohoku, Kanto/Koshin-etsu, Chubu/Hokuriku, Kinki/Chugoku/Shikoku, and Kyushu) in order to streamline distribution by placing the production centers near consumption areas and to avoid natural disasters. The company owns five factories - Shizuoka Sagara, which doubles as a central research center, Hamaoka (both in Shizuoka prefecture), Kobe (Hyogo prefecture), Fukushima (Fukushima prefecture) and Okinawa Nago (Okinawa prefecture) - that produce the majority of tea leaf products and the ingredients for the beverage products, but packaging of beverage products and part of its tea leaf products are outsourced to the factories outside the group to reduce the capital investment risk and to be able to react to the changes in the market environment swiftly (planning and development, development of production methods, hygiene management of the outsourced factories, and quality controls including the consideration for the environment are performed by ITO EN). While the majority of drink manufacturers employ the wholesaling method, ITO EN uses the "route sales system" - its approximately 4,000 salespeople nationwide deliver products directly to retail stores (except for the products delivered to convenience stores). In this system, the salespeople and retail stores can communicate with each other and it enables the better understanding of the customer needs and suggestions from the sales floors to enhance proactive operations. The company has a quality control department, which performs the quality inspections of its products and green tea ingredients based on its own criteria; it also regularly visits the factories of outsourcees, to give instructions about quality control and to audit them. At the regularly held quality meetings, auditing results are fed back to the group production managers and the outsourced factory managers to heighten their awareness of hygiene management as well as the checks to prevent the foreign body contamination originating from the raw materials and the use of prohibited additives. In the view of radioactive contamination after the Great East Japan earthquake, the company has established a system to inspect all its beverage products using radiation dosimeters to ensure their quality. The agricultural population is shrinking nationally due to the aging of agriculture workers and shortage of successors, which is accelerating the further abandonment of cultivated lands and the tea plantation areas are also gradually diminishing. Also 30% of tea trees in plantations are said to be now over the age of 30, making them rather old. To tackle these problems, ITO EN has initiated the Project of the Developing Green Tea-Producing Regions, to contribute to the local communities by revitalizing the abandoned cultivated lands, training the successors for producers and creating employment, and to secure the stable procurement of high quality tea ingredients. Project of the Developing Green Tea-Producing Regions is based on these two pillars: "Contract Farming" and "New Production Area Project," which turns abandoned cultivated lands into tea plantations and nurtures tea growers. "Contract Farming" has been in operation since the 1970s: the company and the tea producers agree a contract that the company buys all produced tea leaves, while the company's agricultural technologies department gives the producers guidance such as the selection of stock varieties, tea plantation maintenance, its mechanization, and low-cost cultivation management using IT. On the other hand, the new production areas project was initiated in 2001 to train new producers who are newly starting to grow tea, revitalizing abandoned cultivated lands, etc. throughout the country. The development of plantations and the production of tea leaves are mostly done by local authorities and local businesses, and ITO EN fully offers its technologies and know-how as well as buys all the produced tealeaves, much like in the "contract farming" setting. In Kyushu, there are many flatlands that are suitable for mechanized large-scale cultivation, and the working hours in some plantations are reportedly less than 1/3 of those in Shizuoka. Medium and Long-term Management Plans - Long-term Vision of "Global Tea Company"
ITO EN's long-term vision is becoming a "Global Tea Company". Under this vision, the company's medium-term management plan from the term ending April 2018 (to the term ending April 2022), presents the qualitative goals of becoming a "Global Tea Company" and the "national general beverage manufacturer: challenge for the new business areas" and the quantitative goals (1) Consolidated Sales of over 600 billion yen, (2) ROE of over 10%, and (3) Total Return Ratio of over 40%. For the "Global Tea Company", the "Oi Ocha" and brands will be globally promoted to make ITO EN the No.1 Company in both the global-and-the Japanese green tea markets. Also the company will work on training "globally-accepted tea tasters". While with the "domestic general beverage manufacturer: challenge for new business areas", it will further strengthen its existing brands and nurture new brands, and strive to expand the total number of customers and fortify the domestic revenue base, not forgetting new businesses' development. With the cost reduction through the Project of the Developing Green Tea-Producing Regions and contract farming with tea producers, and the effective management of fixed cost chiefly through route sales, the company is looking to improve on the net income margin, while it is keen on maintaining a high total asset turnover ratio through "fabless" productions and the slim balance sheet management. As for leverages, it is seeking a suitable capital structure level while supporting both the healthy financial structure and total return ratio of 40% or over, while keeping capital efficiency in mind. In August 1966, Frontier Seicha, Ltd. - its predecessor - was established in Shizuoka city and began the route sales operations of green tea (direct sales to retail stores, etc.). In May 1969, the trade name was changed to ITO EN, LTD. after obtaining the trade name from a tea dealer that was based in Ueno, Tokyo. In August 1979, it became the first company in Japan to become the import agent of the China National Native Produce and Animal Byproducts Import & Export Corporation and started the sales of oolong tea (leaves). In September 1980, it developed the world's first "canned oolong tea" and began the sales in Japan in February 1981 (a serious expansion into the canned beverages market). In 1984, the company succeeded in developing the "T-N blow Manufacturing Method" that enables the maintenance of green tea quality inside the can by removing oxygen, and began the sales of "canned green tea (predecessor of "Oi Ocha") in February 1985. In July 1987, ITO EN (USA) INC. (Hawaii, USA) was established, and in February 1989, "canned green tea" was renamed as "Oi Ocha". IPO, listing in the First Section of the Tokyo Stock Exchange and the expansion in the U.S. In May 1992, its stocks were OTC-registered with the Japan Securities Dealers Association. In February 1993, its coffee roasting processing factory was completed within the company's Shizuoka Sagara Factory; ITO EN AUSTRALIA PTY. LIMITED (Victoria, Australia) was established in November 1994 and the tea plantation development was commenced. Via the listing in the Second Section of the Tokyo Stock Exchange in September 1996, the company was listed in the First Section of the Tokyo Stock Exchange in October 1998. The consolidated subsidiary ITO EN (North America) INC. (NY, USA) was established in May 2001; the crude tea production factory of ITO EN AUSTRALIA PTY. LIMITED began operation in October 2004. In October 2006, ITO EN made the holding company Foodex Globe Corporation whose subsidiary was Tully's Coffee Japan Co., Ltd. into a consolidated subsidiary (eventually the trade name was changed to Tully's Coffee Japan Co., Ltd. in April 2008 when it absorbed Tully's Coffee Japan Co., Ltd.); in May 2011, Chichiyasu Company was also made into a consolidated subsidiary to strengthen its dairy product area. In June 2012, ITO EN Asia Pacific Holdings Pte. Ltd. was established in Singapore to enable business operations in South East Asia, and the joint corporation ITO EN Singapore Pte. Ltd. (currently a consolidated subsidiary) was set up to sell tea leaves and beverages in the Singaporean and Malaysian markets. May 2013 saw the establishment of ITO EN (Thailand) Co., Limited, and in July the same year, the joint corporation PT ULTRAJAYA ITO EN MANUFACTURING (production) and PT ITO EN ULTRAJAYA WHOLESALE (sales) were set up in Indonesia respectively. In February 2015, the US subsidiary made Distant Lands Trading Company (production-to-sales of coffee beans mainly in the USA) into a subsidiary (currently a consolidated subsidiary). Sales and operating income grew with 2.2% and 26.3%, respectively, year-on-year. According to the reference material of ITO EN, the scale of the Japanese beverage market in 2016 was 3,770 billion yen, up 3% year on year (down 1% in 2014, up 0% in 2015), as there was special demand due to the searing summer and the Kumamoto Earthquake in western Japan. Among them, the sales of tea beverages were 912 billion yen, up 4.5% year on year (24% market share), thanks to the sales promotion in response to the renewal of competitors' products. 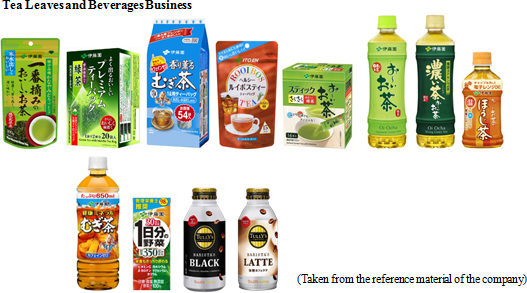 In addition, the sales of coffee beverages were 951 billion yen, up 1% year on year (25% market share), due to the favorable performance of bottle-type canned coffee; the sales of vegetable juice were 152.2 billion yen, up 8.7% year on year (4% market share), as tomato juice sold well; and the sales of mineral water were 284 billion yen, up 6.4% year on year (7.5% market share). In these circumstances, the consolidated sales of ITO EN grew 2.2% year on year to 475,866 million yen. While the non-consolidated sales of ITO EN grew healthily 1.8% year on year, the sales of Tully's Coffee Japan Co., Ltd. and Chichiyasu increased 9.1% and 5.3%, respectively, year on year. The business in North America saw a 4.0% decrease in sales due to the yen appreciation, but in the dollar, sales rose 6.2% year on year. Operating income was 21,774 million yen, up 26.3% year on year, as gross profit rate increased and SG&A ratio dropped. The increase in gross profit rate is mainly attributable to the improvement in the non-consolidated sales of ITO EN, which dominates the sales of the Tea Leaves and Beverages Business. The factors were sales growth, the improvement of sales composition due to the healthy performance of coffee beverages, and the reduction in costs for ingredients, materials, etc. As for SG&A, advertising expenditure augmented 17% year on year, due to the introduction of the new package of "Oi Ocha." Commission paid, transportation cost, etc. increased, but depreciation dropped 26% year on year, due to the change in the service life of vending machines (5-6 years ⇒ 8 years). Non-operating income/loss improved as an exchange gain of 205 million yen was posted (an exchange loss of 1,222 million yen was posted in the previous term), and the ratio of tax burdens declined. Consequently, net income grew 58.9% year on year to 13,693 million yen. Through business expansion, term-end total assets were 302,405 million yen, up 14,703 million yen from the end of the previous term. While the corporate bonds worth 20 billion yen were retired, the corporate bonds worth 10 billion yen (Single A+) were issued, short- and long-term debts were increased, augmenting interest-bearing liabilities. From the term ending Apr. 2018, the company plans to replace leased vending machines with owned ones (in the term ending Apr. 2018, the company plans to invest 13,477 million yen in equipment). To do so, the company procured funds. From Feb. to Mar. 2017, the company bought 341,500 Class-A Preferred Stock of the company by spending 700 million yen. Its financial standing is healthy as current ratio is 214.1% (158.3% at the end of the previous term) and shareholders' equity ratio is 44.8% (43.9% at the end of the previous term). Rate of return on invested capital rose from 4.8% to 6.7%. The decline in operating CF is mainly due to the augmentation of tax payment (3,512 million yen → 6,850 million yen). Equipment investment was 8,135 million yen (8,603 million yen in the term ended Apr. 2016), due to the establishment of manufacturing plant of real Matcha Powder "Matcha Ko Bo" (inside Shizuoka Sagara Plant), Kobe Plant (Kobe-shi, Hyogo Prefecture), etc. Depreciation was 5,418 million yen (5,203 million yen in the term ended Apr. 2016), and the depreciation of leased items was 7,051 million yen (10,872 million yen in the term ended Apr. 2016). The reason why the depreciation of leased items dropped considerably is that the company changed (extended) lease periods according to actual situations. Sales and operating income are estimated to grow 3.5% and 3.8%, respectively, year on year. In 2017, the scale of the Japanese beverage market is forecasted to be 3,790 billion yen, up 1% year on year, thanks to the favorable performance of tea beverages (932.5 billion yen, up 2.2% year on year). As the sales promotion of competitors will lose steam and new products of ITO EN will contribute, the sales of green tea beverages, including "Oi Ocha," and also convenient products, such as powdered instant green tea, are projected to increase. The business in the U.S. is forecasted to remain healthy, and the performance of Tully's Coffee and Chichiyasu is estimated to be robust. As for profits, gross profit rate is estimated to decline, because the costs for ingredients, materials, etc. are conservatively estimated (up 900 million yen), but major expenses are forecasted to increase slightly. Accordingly, operating income rate is projected to be nearly equal to that in the previous term. The company plans to invest 13,477 million yen in equipment (8,135 million yen in the previous term), and depreciation is forecasted to be 13,441 million yen, including the depreciation of leased items amounting to 7,065 million yen. The annual dividend is to be 40 yen/share for common stock (20 yen/share at the end of the first half and 20 yen/share at the end of the term; estimated payout ratio: 35.9%), and 50 yen/share for preferred stock (25 yen yen/share at the end of the first half and 25 yen/share at the end of the term; estimated payout ratio: 41.1%). For the term ended Mar. 2017, the sales of tea leaves grew 3.7% year on year, marking a record high, and the sales of beverages rose 1.6% year on year. The sales of Chinese tea declined due to the shrinkage of the market of oolong tea, while the sales of vegetable juice increased 3.2% year on year, due to the improved performance of "Aojiru (Green Juice)," "Jujitsu Yasai (Vegetable and Fruit Mix Juice)," etc. The sales of coffee beverages for vending machines dropped, while the sales from "TULLY'S COFFEE" rose 7.3% year-on-year. In addition, the sales of mineral water grew 17.7% year on year, due to the favorable performance of "Sui So Sui (Hydrogen Water)" and special demand, and the sales of soda rose 2.4% year on year as the juice-added soda "Vivit's" was adopted by convenience stores. For the term ending Mar. 2018, sales are estimated to be 381 billion yen, up 2.5% year on year. The company will keep promoting the sales of the major brands, including "Oi Ocha," and engage in the combined sale of tea leaves and beverages. The sales of "Oi Ocha" for the term ended Apr. 2017 were on a plateau. In the term ending Apr. 2018, the company aims to increase sales by introducing new bamboo cylinder-type bottles, which possess both design and functionality, and enriching its product lineup. ITO EN will also boost the sales of "Kenko Mineral Mugicha (Healthy Mineral Barley Tea)," whose quantity sold exceeds 30 million cases, and "Ichinichibun-no-Yasai (One Day Veggie)," whose quantity sold exceeds 15 million cases and which is the No.1 brand of 100% vegetable juice (according to the survey of ITO EN), by advertising caffeine-free property and minerals, and nutrients, respectively. The demand for "Kenko Mineral Mugicha (Healthy Mineral Barley Tea)" is not limited to the summer season, but exists throughout the year. The demand for vegetable juice exists throughout the year, and is not affected by weathers. In addition, "TULLY'S COFFEE," which sold about 15 million cases, will enrich its product lineup and implement shop-linked campaigns, to fortify its brand power. As for coffee beverages, the bottle-type can market is expanding, as the conventional steel can market is shrinking. As a strength, the products of "TULLY'S COFFEE" are sold at fixed prices regardless of sales channels. Based on the linkage with these major brands, ITO EN will secure and expand the selling space of convenient green tea leaf products, including tea leaves, tea bags, and instant products. Furthermore, employees qualified as a tea taster will conduct educational activities. According to the survey of ITO EN, the green tea leaf market is shrinking. In 2016, its scale was 236.8 billion yen, down 2% year on year. Meanwhile, the convenient green tea leaf market is expanding, and in 2016, its scale was 25.9 billion yen, up a little less than 4% from 25 billion yen (which has been growing since 2009, in which the collection of data was started). The company is increasing its share in the growing convenient green tea leaf market. Its in-company certification system "The Tea Taster System" (from 1994) was recognized as the first "approved system for in-company certification" by the Ministry of Health, Labor and Welfare on Mar. 24, 2017. For the term ended Apr. 2017, sales exceeded 30 billion yen, as the company actively opened new stores at convenient locations (the number of stores as of the end of Apr. 2017: 671) and area-limited products sold well. For commemorating the 20th anniversary of establishment, the company has released commemorative products, including the products using the rare coffee bean "Peaberry" and the revived dish "Hot Bagel Sandwich," from March. In the term ending Apr. 2018, the company will concentrate on the sale of products other than coffee beverages as described above. The company has commemorated the 100th anniversary of the release of yogurt in 1917. As the time-honored company that released yogurt in Japan for the first time, it pursues "safety, reliability, deliciousness, and health." As its production system was completed in eastern Japan in the previous term, the company will manufacture and sell products in eastern Japan on a full-scale basis in the term ending Apr. 2018. For commemorating the 100th anniversary, it renewed classic yogurt and low-sugar yogurt, and opened the first shop "CHICHI YASU" in the shopping center "LECT" of Izumi Co., Ltd. (Nishi-ku, Hiroshima-shi, Hiroshima Prefecture), which operates supermarkets in western Japan. By utilizing the shop, the company plans to promote the Chichiyasu brand. In addition, it released additive-free honey yogurt and beverages produced in collaboration with Hiroshima Toyo Carp. As for the business in Australia and Asia, it is necessary to deal with the joint venture in Indonesia, but the business in Australia and Southeast Asia was healthy, as the Chinese business, mainly in Shanghai, is expanding at a pace exceeding the estimate, and the business in Thailand and Singapore moved into the black. As overseas brand strategies, the company unified label designs and added the local language indications, in order to promote the "Oi Ocha" brand. In addition, in order to enhance the sales of tea leaves, the company will handle products according to regional characteristics. On June 2nd, the financial results briefing for the term ended Apr. 2017 was held in Tokyo. President Honjo had some time to speak with us after the briefing. In the term ended Apr. 2017, operating income exceeded 20 billion yen for the first time in three years. For the term ending Apr. 2018, the record operating income of 22.7 billion yen (term ended Apr. 2007) is within sight. As I said during the financial results briefing, in the previous fiscal year (the term ended Apr. 2017), tea leaves reached record high sales, and drink sales also increased by 1.6%. There was also a tailwind due to a tomato boom, and the sales of vegetable drinks such as "Riso-no Tomato (Tomato Juice)" and "Vitamin-Yasai (Vitamin Vegetables)" increased. "Aojiru (Green Juice)" with soymilk is also doing well. For coffee beverages, "TULLY'S COFFEE" continued to perform well. "Oi Ocha" leveled off, held back by the performance of other companies. For this reason, this term (the term ending Apr. 2018), we intend to strengthen sales of our main brands, centering on "Oi Ocha". From the fourth quarter of the previous term to the first quarter of the current term, we released new products such as "Matcha green tea" and "Oi Ocha" renewal products. We also increased our advertising expenditure. In the current term, we want to challenge things we've never done before, particularly trying to attract the younger generation. In the term's first half, the singer "Yuzu" is scheduled to perform live at four different world heritage sites (Nikko, Mt. Fuji, Kyoto, and Okinawa) as a marketing campaign. "Oi Ocha" boasts overwhelming popularity among the 50's and 60's age groups, but I would like to aim for a brand that is accepted by every generation. I see, even while holding the top share in Japan, there is still room for growth in terms of a strategy toward the young generation. So that's why you intend to take on new challenges. We also have events and campaigns planned for the term's second half. That doesn't necessarily mean spending more money, but I still want to do something different. Specifically, we will adopt methods such as digital marketing, direct communication, and active use of SNS. Our company is a little behind in the use of SNS. We established a specialized department and adjusted this system. Actually, Silicon Valley IT company employees drink "Oi Ocha" in the company cafeterias. Since there was no sugar-free culture in the US market, we entered with flavored tea "TEAS' TEA" (2002), and due to the success of the public awareness campaign for sugar free drinks and the increase in health-consciousness, green tea became popular among Silicon Valley IT companies, and this has led to a Matcha boom. I would like to apply this to Japan, as well. The US business is also on track. Although it was affected by the appreciation of the yen in the previous term, dollar-based sales increased by 6.2% and operating income increased by 17.9%. Global tea bags are expanding the sales floor space at natural food markets and chain stores nationwide. The results of our efforts to make green tea more popular and establish the brand can now be seen. The fact that other companies' offensives slowed the growth of "Oi Ocha" is a little concerning. In the past, the green tea beverage market has experienced several difficult competitions, referred to as "green tea wars". However, the market has grown each time. Even when we temporarily decreased a market share, we always restored our market share in the expanded market. Currently, "Oi Ocha Ryokucha (Green Tea)" and "Oi Ocha Koicha (Dark)", which were renewed on May 22, are doing well. They are characteristically clear, with a sense of transparency. Actually, a very difficult technique is needed to make tea clear. If it is cloudy, it degrades easily, and gains an unpleasant taste. We have patented technology that can make tea clear. The "Oi Ocha with Matcha", which is popular with the younger generation, is not simply muddy; it adds Kyoto Uji Matcha in order to differentiate itself. Sales volume for "Hoji (Roasted Green tea)" is steadily increasing, centered on women. "Oi Ocha" uses 100% domestically produced tea leaves. As part of our ESG, through tea farm development businesses (contract farming, new areas of production), we are also working on the promotion of environment-preserving agriculture and effective use of abandoned farmland. For example, in Kyoto and Kagoshima prefectures, we have created farming contracts for raw Matcha (powdered green tea), enabling a stable procurement of high quality raw tea leaves. A new medium and long-term management plan (till the term ending Apr. 2022) started from the term ending Apr. 2018. Under the long-term vision of being a "Global Tea Company", you will make efforts toward achieving this long-term vision and to develop domestic comprehensive beverage manufacturers and new business territories. Also, as the final goal for the term ending Apr. 2022, your company have set sales of 600 billion yen, an ROE of 10% or higher and a total return ratio of 40% or higher. Last year, there were 41 brands in Japan which sold more than 10 million cases, accounting for about 75% of total sales. Currently, in addition to strengthening 4 mega brands (annual sales volume: over 30 million cases) and major brands (annual sales volume: over 10 million cases), we want to grow 2 or 3 new brands into major brands. We will also put more effort into sales of tea leaves whose sales are making new record highs. Whether tea leaves or drinks, I would like people to think of ITO EN when they think of tea. We are already No. 1 in the expanding Matcha market, but even as the market continues to expand, we will maintain the No. 1 position. We will also put effort into new categories. For example, we would like to utilize patented catechin extraction technology not only in beverages but in a wide range of fields. We are also expecting a lot from "Healthy Rooibos tea", a functional display food. While we are confident in product creation, we recognize that marketing is an issue. As already explained, we are aiming to be No. 1 in every generation, and we are adopting new methods such as digital marketing and direct communication. We also work on acquiring new customers. Demand for Matcha is increasing for business use such as the making of confectionery and bread. Outside Japan, sugar-free tea has become popular. Centering on the US and China, we intend to expand both the drink and tea leaf sales. For drinks, starting this term, each country's version of the "Oi Ocha" label has been standardized, while still using the local language. For tea leaves, we will continue to focus on expanding sales of global tea bags. Under the copy "We deliver Smile and Tea to where you are. ", the entire group aims to become a "Global Tea Company". We hope to improve the outcome of these initiatives and achieve our sales target of 600 billion yen. In the term ended Apr. 2017, we also enjoyed temporary tax deductions, and the ROE was 10.5%. We will continue striving to improve profitability and aim to keep an ROE of 10% or higher. For the term ended Apr. 2017, we will pay Common Stock dividends of 40 yen/share and Class-A Preferred Stock dividends of 50 yen/share. Regarding Class-A Preferred Stock, our company also purchased its own stock (Note: 341,500 shares, 700 million yen). As of the beginning of the term ending Apr. 2018, we expect these numbers to be 40 yen/share for common stock and 50 yen/share for Class-A Preferred Stock this term as well. So there are many things you should do, and it seems each one could be a factor for growth. On a different topic, your company attracts investors' attention not only in business results, but also in CSR/CSV management, and even through success in ESG. Also, the SDGs were adopted by the United Nations in 2016. In the tea farm development business, which is one part of the CSR/CSV effort, the tea farming area has expanded, and the production volume seems to be steadily increasing. The Principles for Responsible Investment, which should reflect ESG issues in the decision-making process of institutional investors within the limits of financial responsibility, were proposed in the United Nations in 2006. Our multi-year efforts such as "Project of the Developing Green Tea-Producing Regions" (Note: Started a new harvesting area business to turn abandoned farming areas etc. into tea gardens in 2001) and "commercial farm development" (Note: Contract farming began in the 1970s), "used tea leaf recycling system" (Note: Used tea leaves are used to make corrugated cardboard to pack products, envelopes and business cards. "Tea fused board", a wooden fiberboard containing used tea leaves, was completed in 2001) were the efforts for the ESG issues. At first, only foreign investors showed interest, but the number of Japanese investors and recently of young people with interest has increased. Our efforts such as "Project of the Developing Green Tea-Producing Regions" and "used tea leaves recycling system" were evaluated and ranked 18th in business magazine "FORTUNE's" featured article, "50 companies that change the world", on September 1st, 2016. This is the highest rank for Japanese companies. Since the ingredients of our main products are harvested from the fields, we would like to continue putting efforts into things that lead to supporting agriculture. We have begun a new approach in cultivating young barley leaves as ingredients for green juice, and also carrots for vegetable drinks. Since providing topics is not our goal, we would like to do what we are able to do around our products without appealing to the outside. As the agricultural working population declines and the aging of agricultural workers has become a social problem, we would like to consider creating a framework that allows young people to participate in agriculture. I see. The procurement of tea leaves, which is your company's efforts to solve problems, leads to the utilization of abandoned farming areas and job creation, which in turn solves social problems. It is difficult to understand when we hear CSR/CSV management, but it is easier to comprehend when we think of actual efforts such as "Project of the Developing Green Tea-Producing Regions", "Training of the Tea Farmers" and "used tea leaf recycling system" as examples. Finally, please give a message to investors. As represented by the mega brand "Oi Ocha", our company is often seen as a drink manufacturer, but it is originally a "tea house". I would like people to see us as Japan's best "tea house" going out to the world and competing in the world. That is the "Global Tea Company". Domestic tea leaf markets are showing a tendency of shrinking, but the market for convenient products with a different form is expanding. We would like to compete overseas with an overwhelming market share that makes people think of ITO EN first when it comes to tea leaves and drinks in Japan. That is our spirit. We appreciate your continuous understanding and support in the future. The appearance of "Oi Ocha" is "clear transparency with no muddiness." However, it has a pleasant, full bodied taste. The best "tea house" in Japan will go out to the world and compete in the world. The message of President Honjo saying "that is the 'Global Tea Company'." was also a tasteful message that resonates in investors' hearts. Despite the interview taking so long, thank you so much for the polite responses. Considering the past successful patterns, the sales of green tea beverages are estimated to grow this term. In the past, as the market has expanded, ITO EN temporarily decreased its share, but then recovered it in the expanded market. In the term ending Apr. 2018, the company plans to improve its performance by introducing new and renewed products and using new marketing strategies. The renewed "Oi Ocha" is characterized by its mild, clear taste and the bamboo cylinder-type bottle, which protects the tea taste from light. For the limited-time "Koori Mizu-dashi (Cold Brew Green Tea)," the company brews tea with iced water to curb bitterness and astringency, while bringing out umami taste and sweetness. The strategies as a general beverage manufacturer are essential, but for this term, the sale of green tea beverages is noteworthy. We also need to pay attention to the business in the U.S., which is expected to see a 13.5% sales growth in local currency. The effort to diffuse sugar-less products and cultivate sales channels in the U.S. market is paying off. According to IMF, the GDP of the U.S. in 2017 is 19.4 trillion dollars (over 2,100 trillion yen), nearly four times that of Japan. Accordingly, if its products are popularized in the U.S. on a full-scale basis, the impact on its business performance will be unmeasurable. In the term ended Apr. 2012, the ITO EN Group developed a CSR system that conforms to the "ISO 26000" guidelines on organizational social responsibility. In "ISO 26000", there are 7 core subjects: "organizational governance", "human rights", "labor practices", "fair operating practices", "the environment", "consumer issues", and "community involvement and development (community issues)". In order to create shared values (CSV: Creating Shared Value), the company promotes a "CSR/CSV" management style that aims to solve "the environment", "the consumer issues" and "the community issues" for itself and for the society. Within this context, the United Nations adopted the "Sustainable Development Goals (SDGs)" (17 goals and 169 targets) in 2016. In aiming to be a "Global Tea Company", ITO EN believes that this adoption can become the common language for sustainability, and that by adding "SDGs" to the ISO26000's combined system of "CSR/CSV", it can further deepen the understanding of the social issues related to the group. For example, the tea field cultivation business contributes to local revitalization, creation of jobs, and stable management of producers, while producing a steady procurement of high quality tea leaves. This is ITO EN's representative CSV activity for addressing the community issues mentioned in ISO26000. In relation to SDGs, the company understands that these activities also contribute to the goals regarding "sustainable consumption and production", "sustainable agriculture", and "sustainable community development". While engaging in human resource development and coming up with ways to enable employees and the local community to learn sustainability together, ITO EN uses its core business to promote activities such as local revitalization, which is a social issue, and the legacy-creating international "Sports Years" cultural programs. These efforts have resulted in a higher evaluation from outside the company. For example, in addition to receiving the "Porter Award" in 2013 for competitive strategy, in 2015, the Project of the Developing Green Tea-Producing Regions received the "Minister of Agriculture, Forestry, and Fisheries' Food Industry's Excellent Company Award". The new environmentally conscious aluminum free paper drink containers, which are recyclable and can be distributed at room temperature, won the "Minister of the Environment's Global Environment Award". CSR activities also won the "Minister of Economy, Trade, and Industry's Japan Water Award". Awards like these and evaluations of ITO EN's contribution to the creation of a sustainable society are rapidly increasing its number. "Always Putting the Customer First" is the ITO EN Group's management philosophy. In the ITO EN Group's Basic Policies, the basis of our business administration to take corporate social responsibility in cooperation with interested parties such as the government, local communities, consumers, shareholders, clients, suppliers, and financial institutions, in order to achieve sustainable growth and development as well as increasing our corporate value. This management philosophy is the fundamental policy behind our group's corporate ethics and the unchanging truth that supports our corporate governance. Based on this philosophy, all the executives and employees of our group will actively pursue an operation that works towards a sustainable society while responding to the trust of all the interested parties. To realize an appropriate form of corporate governance, our company, which has a board of auditors, carries out audits in which the auditors inquire the business conditions, the decision-making processes, etc. of the representative directors, the directors in charge or the employees of our group companies. The auditors attend the meeting of the board of directors every time to give their objective and impartial opinions regarding the audit situations concerning the company or individual issues, and audit the business executions of the directors according to the audit policies set out by the board of auditors. As for important matters such as nominating a director or his/her remuneration, independent outside directors should be consulted for their appropriate involvement and advice, for example, by setting up a voluntary advisory committee. (1) Nomination and appointment of directors and auditors are carried out by the board of directors after deliberations in accordance with the nomination policy specified by the board of directors that includes outside directors, and (2) remuneration is appropriately determined, based on the remuneration policy set forth by the board of directors that includes outside directors, within the framework of the total remuneration amount for the directors determined by a general meeting of shareholders. Our company will strive to listen to the voices of shareholders, take due interest in their views and concerns, and explain our management policies plainly to promote their better understanding through constructive dialogues with shareholders by our executives. For further details, please refer to the "Activity Conditions concerning IR" section of this report. Copyright (C) 2017 Investment Bridge Co., Ltd. All Rights Reserved.